Here is the part two of the article where we will be developing three mobile client application in iOS, Android and Windows Phone 8 that will consume WCF service that we developed in Part 1 of this article. Here is the part two of the article where we will be developing three mobile client application in iOS, Android and Windows Phone 8. You can read part one here and grab the source code from that article in Source Code section at last. We will be using this source code now onwards. • Part 1 source code. Download from here. Open XamarinWCF solution and add one new project of type HelloWorld Application under iOS project. Name this project iOS. Now we will construct the UI in the code. You can however design UI in Xcode designer. Have a look at this article to know more about it. As our UI is pretty simple, I decided to do it via code. Open MyViewController.cs and replace all code with following. As per Listing 1.0, we have created couple of UILabel and UITextField along with UIButton. View.AddSubView adds these controls in current view so it can be displayed when application runs. Now let's call our CalculatorService that we created in Part 1 of this article. For that, just add reference to ServiceAgent project. Also we need to add references to System.Runtime.Serialization, System.ServiceModel, and System.ServiceModel.Web. Adding these references will be common for all three mobile applications. With all these done, let's add the following code just above View.AddSubview(lblValue1); line. Here as per Listing 1.1, the call to DoSum method on agent returns Tast<int> object. It is asynchronous operations so I need to use await for the task. 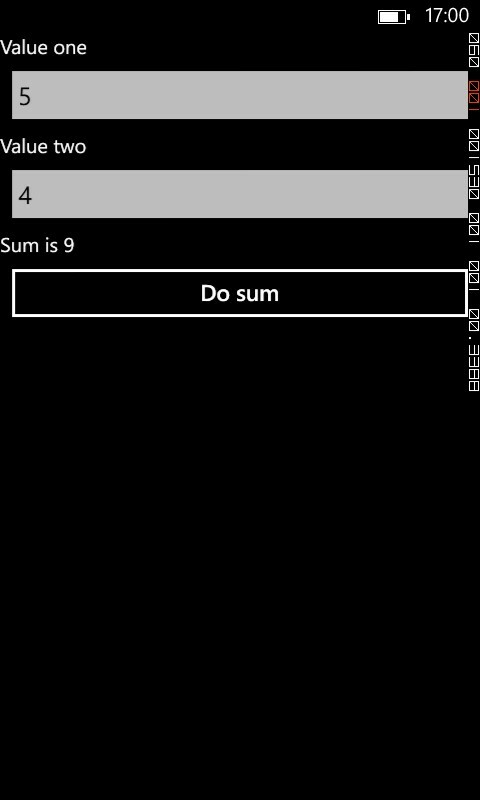 Once it executes, it shows the result in lblSum. Now go ahead and Press F5. I assume that you have setup networked Mac machine for build running Xamarin build host. If not, please go through the links in Perquisites section at the beginning of this article. Figure 1.0 shows our iOS app in action. I just put two values and hit Do sum button and result is displayed just above the button. 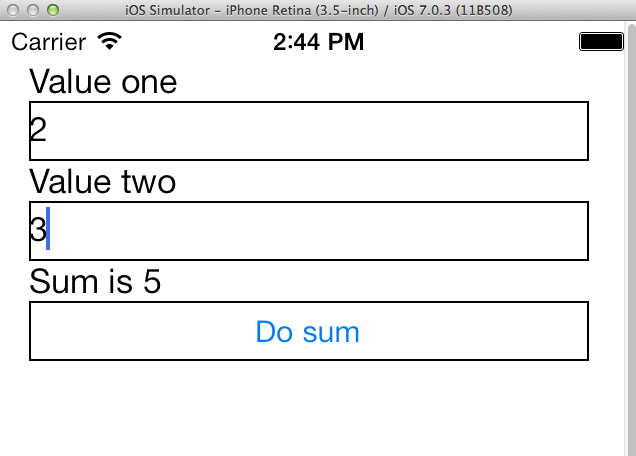 It is just cool to develop iOS app in C#! Let's quickly build Android app. 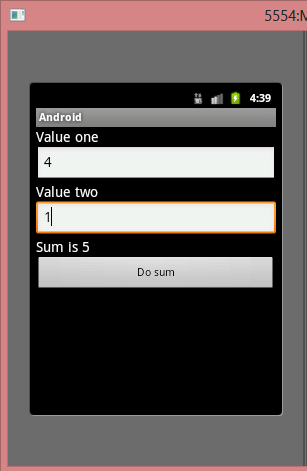 Add new project of type Android Application to XamarinWCF solution and name it Android. In an android project, the default view is defined in Main.axml file located in Resources\Layout folder. To create view, you can use Android designer in Visual studio or can directly construct using markup. For our application, the complete xml markup is as following for Main.axml file. The markup in Listing 1.2 is pretty self-explanatory as we are setting text and layout properties like height & width for the controls. Now the code for talking to service will be placed in Activity1.cs file. But before that, complete steps mentioned in section Adding references for CalculatorService above. Once you are done with it, just write following code for Activity1.cs. Here as per Listing 1.3, the caller part to WCF service via agent is same as what we wrote for iOS app. At this point, you are all set to hit F5 and see Android app in action as Figure 1.1. Now you are all set to hit F5 and run the application. I have Nokia Lumia 720 so I connected that to test the app. Following is the screenshot of the app running on my phone. I hope you enjoyed this article so much as I while writing!